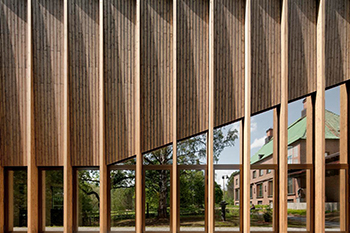 Kommerling warm edge system, Ködispace 4SG, has been used in a recent extension to the Gösta Serlachius Museum in Finland. The Gosta Pavilion is the latest addition to the home of the industrialist and art collector, Gosta Serlachius. Designed by Spanish architect, MX-SI, the extension’s structure consists of 100 parallel laminated timber frames, interspersed by high windows. The pavilion, which took 18 months to construct, is 135m long and 17m high at its maximum height. It is joined to the Serlachius private family residence, a brick house with a copper roof, by a glass corridor. The addition of this new building has reportedly increased the museum space by 500m², to a total of 1.500m², and it houses both a permanent exhibition of the Gost Serlachius art collection alongside varying exhibitions by both Finnish and international artists. The silicone-sealed glass panels in the project were manufactured by Finnish company, Seloy, with specialist sealant made by Kommerling. The bonded elements conceal a special warm-edge system, which thanks to flexible edging, is said to be equal to the wild temperature extremes of the local climate. At the heart of the sealing process is a separator called Ködispace 4SG. According to Kommerling, the warm-edge system menas that insulation panes are ‘extraordinarily’ robust, resilient and durable and also ideally suited for the physical requirements of structural glazing. Ködispace 4SG is said to considerably enhance the aesthetic properties of glass elements; there are no ‘ugly’ separator displacements in the three-ply insulation panes or disruptive light reflections that can be caused by metal parts. The black sealant ensures that the space between panes is almost invisible and sight lines from within the museum are unhindered, giving the impression of a ‘fluid transition’ between the building and its surroundings. 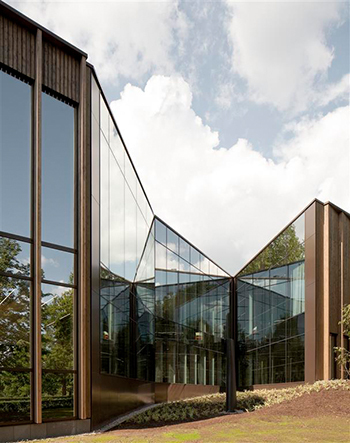 GGP: What sort of problems can arise with glass facades? KG: The extreme temperatures occurring in the faces cause the insulation glass to expand and pull together again, thus exposing the edging to enormous stresses. If the sealant is not able to accommodate this movement and instead compensates for them, the seal becomes leaky, hence elasticity of the sealant is a significant precondition for permanently, well-sealed insulation glass. If the seal cannot be maintained then there is a risk of loss of gas and thermal insulation. Material incompatibility among the adhesives and sealants used and in interactions between construction materials deployed can also cause additional problem, which in the worst case scenario can lead to expensive and hazardous structural damage. GGP: Why is Ködispace 4SG so well suited to structural glazing? KG: Black polyisobutylene is extruded from the barrel direct on to the disc to create a well-sealed, homogeneous separator. In the process it replaces primary sealant, metallic separator and desiccant. Its special formulation allows it to form a chemical bond with the glass and secondary sealant silicone. The overall edging remains permanently elastic and gas-tight over the long term. Kommerling also offers suitable secondary sealants that are fully compatible and thus provide a reliable and safe warm-edge system. GGP: How has this sealant benefited the Gosta pavilion? KG: Serious cold puts additional strain on glass. The warm edges of Ködispace 4SG are great at surviving the severe sub zero temperatures of the Finnish winter without any problems. It is clear that this climate places great demands on thermal glass insulation and its durability. Without the appearance of an unsightly separator, the warm edge approach allows the interesting architectural design to deliver maximum impact.